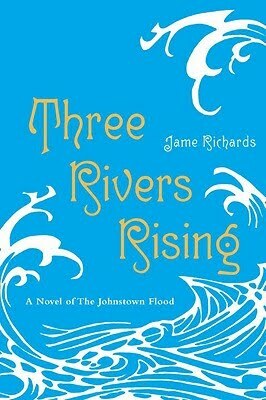 Three Rivers Rising: A Novel of the Jamestown Flood by Jame Richards. Grades 7 and up. Knopf, April 2010. Review copy provided by my local library. But all will change in 1889. People make their plans. But nature will conquer all. I love historical fiction about events that I didn't know anything about and this book absolutely fits the bill. Lake Conemaugh was a man-made reservoir, stocked with fish for the pleasure of rich tourists. Though the dam showed signs of wear, the owners neglected to make the necessary repairs, even though tons of water threatened thousands of people living in the valleys below the resort. In 1889, the dam broke, flooding the valley and killing thousands. Three Rivers Rising explores this tragic event through the eyes of several different characters. Celestia, daughter of a nouveau riche family. Peter, son of a Pennsylvania miner. Kate, broken-hearted nurse traveling east to New York. And Maura, loving mother and wife to a railroad engineer. Though the meat of the story concentrates on Celestia and Peter, the other stories intertwine with theirs and they all come together in the end. I thought this was a really effective way of showing the event and how it affected different kinds of people. I have mixed feelings about novels in verse and this book was no exception. In my opinion, very few novels in verse are actually poetic enough to merit being told in that format. But maybe I feel that way because I don't know very much about poetry... this is very possible. Anyway, the format was fine, but I wonder if the story would have been richer had it been told in straight prose rather than prose poems. Ms. Richards does include a nice author's note and a list of sources for those interested in learning more about the Johnstown Flood. I enjoyed Three Rivers Rising and I'd like to thank Kelly of Stacked for her review that made me want to read the book. I'd hand this book to teens who liked the setting of Jennifer Donnelly's A Northern Light or the format of Ringside, 1925: Views from the Scopes Trial by Jen Bryant. Three Rivers Rising is on shelves now!